Last week, we took a look at how renegotiating rates could be a “BIG” decision to improving your financial situation. This week, we will conclude our discussion on “BIG” decisions by covering the final financial “BIG” and summarizing the lifestyle “BIG” decisions you could make. If you are paid hourly, ask your boss how you can earn more hours or overtime or what you can do to earn a raise. Find a part-time job or become a temp. Rent a spare room in your house. Offer your own services such as dog walking, babysitting, house sitting, running errands for the elderly, cleaning, landscaping, maintenance, carpentry, tutoring, coaching, photo/videography, graphic/web design, and more. Sell your own products such as handmade crafts/jewelry, up-cycled garage sale items for resale, and fruits and vegetables from your garden. Sell direct sales products such as Avon, Mary Kay, Scentsy, Tupperware, and others. Become a blogger, mystery shopper, write product reviews, or complete surveys. Get paid to wrap your vehicle in advertisements. For more ideas on how to make money, check out this fairly comprehensive article I found while doing some research, titled “52 Ways to Make Extra Money”. You could invest more money toward your savings/investments, which could mean having a better lifestyle during retirement. Since you will be working a little more for your money, you may be inclined to make better decisions with how you choose to spend/invest it. (cue music “You work hard for the money, so hard for it honey!”). Using your free time wisely to earn more money might keep you from filling your free time by spending it. Many of these activities may result in broadening your professional and social network, which could lead to even more opportunities to earn more money. Many of the ways to earn more money could be intellectually and emotionally exciting and rewarding, since you could challenge yourself, learn something new, explore your creative side, help others, and more. Some of the methods could also increase your level of physical activity and wellness, such as is the case with dog walking, landscaping, etc. Effort: Yes, earning more money takes a little more time and energy than some of the other financial “BIG”s explained in this blog series, but depending on how you go about earning the money can determine if the benefit is worth it. 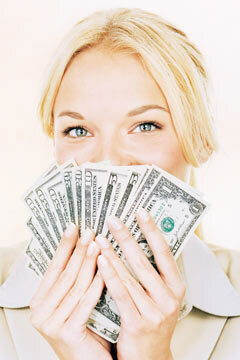 First, decide which method(s) of earning more money seem most appealing and get started on a plan for each. For instance, if you’re going to talk to your boss, set up a meeting and prepare what you are going to say; if you want a part-time job, update your resume; if you’re going to offer products/services, make sure you have all the necessary supplies. Next, implement your plan of action by applying for jobs, notifying others of your available services/products (by using word-of-mouth or online sites like Craigslist, Etsy, Ebay, Fiverr, Facebook), signing up for direct sales programs, mystery shops, surveys, or whatever it takes to get your method actually started. Finally, when it comes time to get out there and “earn that dough”, give it your best effort. For example, perform better at work than you ever have; impress your boss and co-workers at your new part-time job; be the best dog walker, baby sitter, landscaper, or graphic designer you can be; push yourself to sell more products; explore new and creative ways to earn more money. When it comes time to actually earning the money, if you (as they say) “hit the ground running”, then you will be well on your way to earning more and more money as time progresses and your endeavors continue to succeed. Stay tuned for tomorrow’s post which will wrap up our series by summarizing the three lifestyle “BIG” decisions you could make!